You have an awesome idea to start an online store for baby this year? 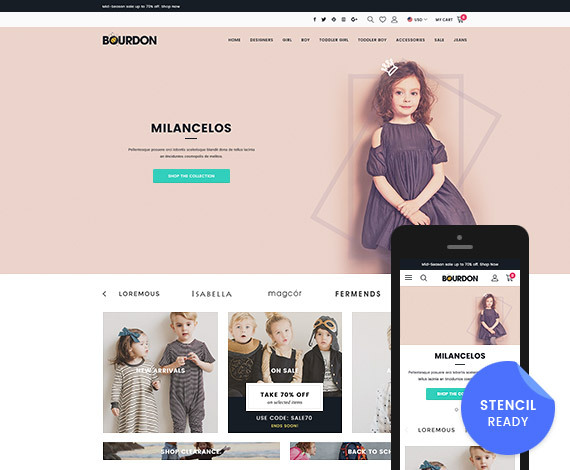 Bourdon – Responsive BigCommerce Template (Stencil Ready) is your ideal destination. Bring to you an elegant and perfect design. Bourdon has the professional color mix & match. The nice combination of Slideshow and banner blocks on the homepage will attract the deepest impression from your customers. Let us list some powerful theme features with Bourdon: Advanced Mega Menu, Catalog Category Search, Popup for Login & Register, Recent Sale Popup Notification, Custom Brands Page Layout by using Alphabet, Images & Videos Gallery, Instagram Gallery… All of them support best for your online store. Moreover, are you looking for a Mobile-First template for your BigCommerce? Bourdon is also a best choice, we know well that using smartphone now is increasing rapidly, a Mobile-First theme with all optimized elements on Mobile/ Tablet version will bring to great shopping experiences for your customers. Let check it out demo store on your devices. This is a perfect Responsive Template. Theme is built with Stencil framework, compatible with the latest BigCommerce platform. We have detailed theme manual as well as Instruction Video, easy to install and configure everything by yourself (Instruction Video Guide also included). How if you like Bourdon but not for Baby Fashion? Let create the smart difference with Bourdon for other Fashion store, Luxury Jewelry & Accessories Store, Luxury Bags Store, Shoes Store… and much more. We hope you like our new bigcommerce theme, will try and enjoy our bigcommerce themes & templates as soon as possible. Let be First! Don’t wait to the last. This add-on adds the possibility for frontend Bigcommerce users to login, register & logout via an AJAX sidebar. AJAX is a combination of technologies that will let users updating parts of a your web store without reloading the entire page. Ex. : when you want to log in to account dashboard, clicking the “Sign In” top link will going to the My Account Page. With AJAX Login, clicking the “Sign In” top link will display a sidebar so users can login without going to My Account page. This add-on will help you decrease the number of pages your customers need to load to access their account and thus improve their navigation through your website. Catalog Category Search allows users to search within a category or subcategory, by adding a drop-down list to the quick search bar. As an aid to the user, the active category is automatically selected in the drop-down list. Besides using Bigcommerce’s default paging, you can also use our infinite scroll module. Infinite scroll has been called autopagerize, unpaginate, endless pages. But essentially it is pre-fetching content from a subsequent page and adding it directly to the user’s current page.